Advanced AutoUpgrader component (see above), which allows to create auto-upgradable software without a SINGLE LINE of code! It contains built-in Application Update Wizard, built-in multi-language support (it automatically recognize language used on user’s PC and show all messages in native language. Current version automatically translates all wizard’s content to 13 languages: English, Spanish, German, French, Russian, Portuguese, Italian, Dutch, Danish, Chinese (both), Estonian and Ukrainian. However, if you don’t want to use built-in Wizard, you can make customized progress-dialogs using numerous events. If you store newer version of your program in password protected Web directories, you can pre-configure the username/password to access files, or let the AutoUpgrader to prompt login information from user when it’s necessary. 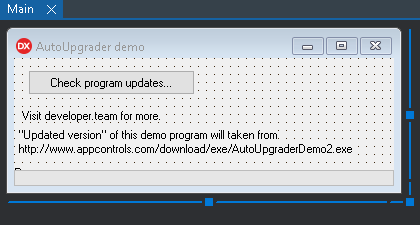 With AutoUpgrader your customers will use only latest versions of your software. Package contains two bonus components from AppControls pack: acHTTP (WinInet-based HTTP client which also supports file uploading, introduced in RFC1867, Internet Explorer’s cache etc. See also WinHTTP.) and acThread (easy to use thread component which also works on AcitveForms of D6 and D7).